The owners of this property are looking for a quick sale and have priced their property accordingly. This home is a great start for first homebuyers, retirees, singles or investors. Set in a quiet no through street surrounded by quality family homes this home has value for money written all over it. There are 4 air-conditioned bedrooms all built-in whilst the master has an ensuite with a spa bath, seperate shower and a walkin robe. The light & airy main bathroom is central to the other bedrooms and has a plunge bath and separate shower. With 2 airconditioned living areas, this home offers spacious living, neat as a pin kitchen with plenty of bench & cupboard space, pot draws, dishwasher, stove & hotplates, stainless steel ducted rangehood large fridge space, island bench, breakfast bar and pantry. 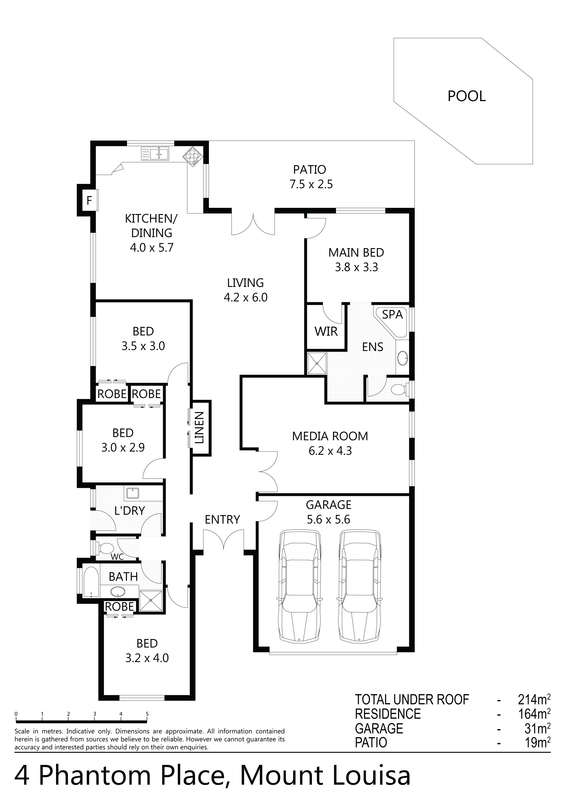 There is also a spacious media room great for home movie nights or watching the footy. The kitchen adjoins the dining, lounge and family area and leads out to the undercover tiled entertaining area that overlooks a sparkling plunge pool with waterfall. This area is a great place for barbecues or entertaining large groups of family and friends. The double garage has secure direct entry into the home and the yard is fully irrigated by an automatic sprinkler system. Only a short distance to Calvary Christian School, local IGA & speciality shops and Domain Central make this an ideal place to live. All this and more in a family friendly area close to all amenities. So many features, so many options. Superb!! !